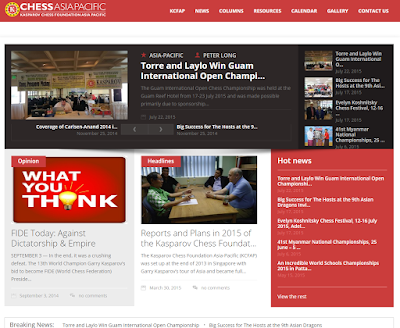 The Kasparov Chess Foundation Asia-Pacific is pleased to announce the relaunch of our website - www.chessasiapacific.com - as a showcase for chess in the Asia Pacific and welcome your news and contributions. I will be the Editor in Chief/Webmaster and can be contacted at peterlong@aol.asia as well as peterlong@chessasiapacific.com and look forward to working with all of you to further promote chess in our region. We hope that together we can bring attention to the many efforts of local organisers that may not receive the coverage and recognition they deserve, and through this website we wish to complement the work done by the various official websites as well as those news services provided by the popular commercial websites. Malay Mail Online: The Rise And Rise Of China?